Every few weeks or so my friend Frances Palmer sends me a terrific picture of one of her pots brimming with flowers. She and her husband, Wally, have creativity coming out of their fingernails, so I’m never surprised that she can whip up such wonderful pictures, to say nothing of her pots. Wally is now designing men’s shirts. What is always a surprise is to open an email and have a bright, joyous riot of color unfurl across your desk, a banner of cheer and good will. I think she ought to start a subscription service, where for a modest sum (proceeds of which go to buying flowers), you can sign up to get a monthly photograph of one her idiosyncratic bouquets. You should see the dahlias she grows. I will have to pull together a little photo album of my favorite e-bouquets so far, but in the meantime, have a look at these. And consider how you, too, can send a bit of brightness through the virtual mail. What a pleasure to find your delightful blog. My friend Tamara Matthews-Stephenson at Nest mentioned you & I knew I was in for a inspiring visit. I also love all the goodness that comes from Frances Palmer's studio & garden. Have you seen the size of her dahlias! Dominique, I look forward to reading Slow Love Life and visiting with you again soon. Enjoyed reading your writings. I read lots of books with all the time available when not working. I love your blog and your writing defines all of the emotions that I experienced during a painful divorce, raising two children and relishing the peace and gratification I feel by fixing up my house. My house is almost an animate object. Something I struggle with since my children have left. Please tell your friend Frances that her pottery has brought a renewed spirit inside my home. It has led me to cooking more and having people over. I love the hand made pieces-they are more then I want to spend. I cannot think of a more lovely piece then the handmade heart. Oh, I adore Frances' pottery. I salivate every time I see one of her pieces, and am so glad you featured her here. And the idea of cut flowers is making my longing for spring even more intense--I guess it really IS time to go start prepping the garden! Most of all--love that you've started this blog, and can't wait to read the book. I am a longtime fan who practically cried at the end of HG, and it's so wonderful to read you again! So good to read your article in last weeks'Times. I always read your editorial first in each month's House and Garden. Good luck with your new book. Hi Dominique--I met you at one of Jacqueline's dinners, and then saw you on CNN Sunday morning. I was so affected by that interview, by your story. I had a similar career trauma about two years ago, and have had to reinvent and rebuild. I just wanted to say bravo for your honesty, and I am ordering a copy of the book, which I'm sure I will enjoy. 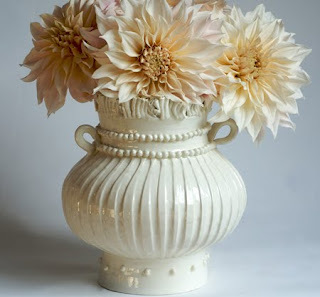 i've always loved dahlias for their color - but this totally works!